¶ 1 Leave a comment on paragraph 1 0 The NCFR Board and executive committees worked on ways of expanding services to practitioners, and the decision was made to publish an additional journal. The Family Coordinator was designed to meet practitioners’ needs. Membership in NCFR reached its highest peak: 5,500. Income reported for 1966 was $89,818. 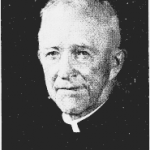 ¶ 2 Leave a comment on paragraph 2 0 That year, one of NCFR’s most dedicated clergymen and ninth President, Msgr. John O’Grady. died.